First Frost Stamp Set and Frosted Bouquet Framelits. 1st September is National Wattle Day in Australia, a day to celebrate Australia and all Australians. And of course, it is also the first day of Spring in the Southern Hemisphere. Wattle Day is often used as a fund raising day for local community causes. In World War 1, Wattle Sprigs were sold to raise funds for injured soldiers. Wattle is out in bloom all over the place and it’s vibrant yellow flowers are a joy to see. 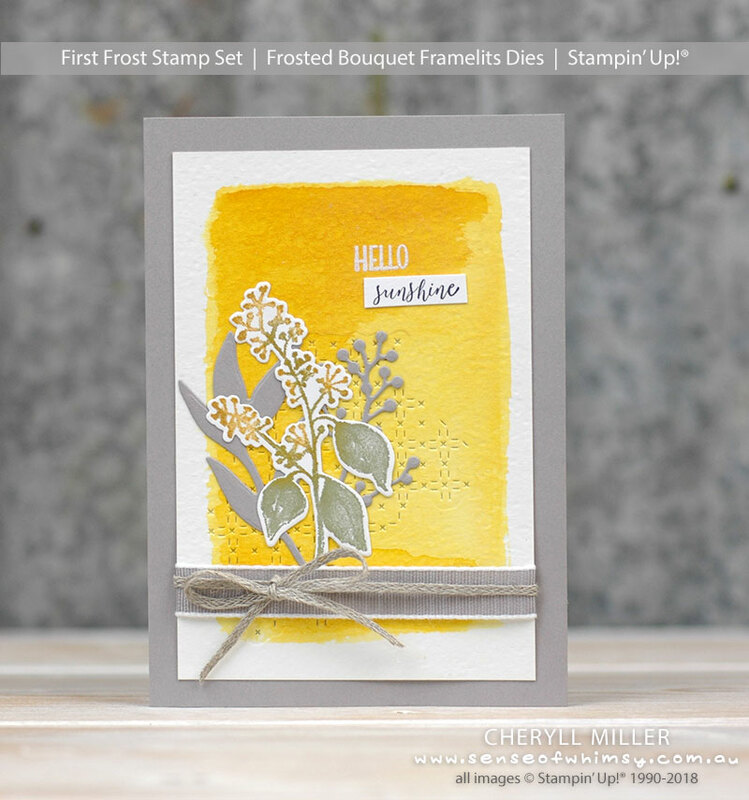 This floral image from First Frost Stamp Set (coming on 5th September in the new Holiday Catalogue) looks a little bit like Wattle when coloured up with yellow ink. I have utilised my trusty Stamparatus to colour and blend this image on the stamp. The leaves are a combination of Pear Pizzazz and Garden Green, and the flowers are Pear Pizzazz and Crushed Curry. 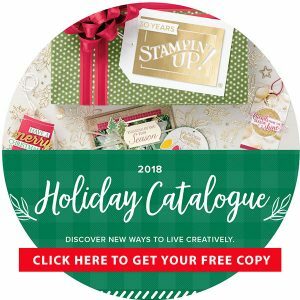 If you would like to see a video of the process, jump on over to my Stampin’ Up! facebook group and check out my live video from last week. 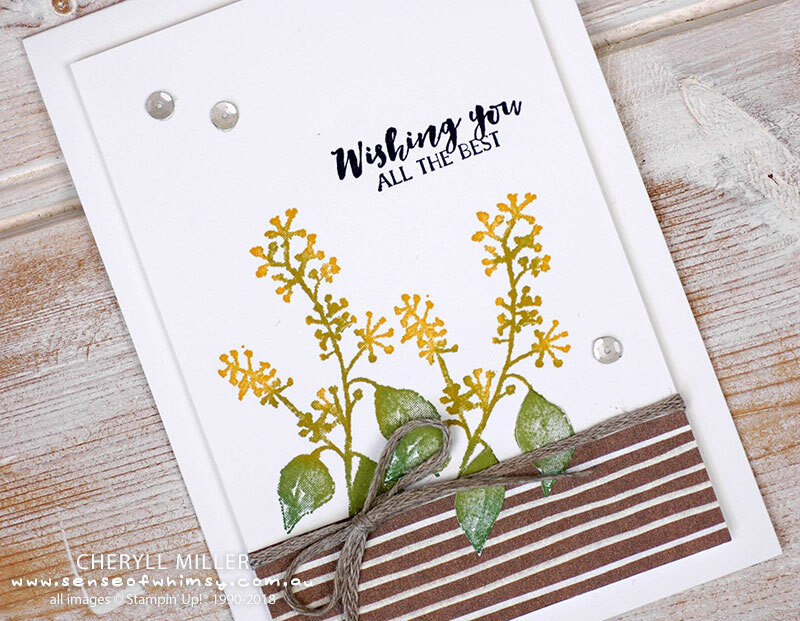 This is a very simple card … the strip along the bottom is a lovely shimmery strip from Frosted Floral Specialty Designer Series Paper. You are going to adore this paper and all it’s shimmery glory! The Braided Linen Trim is new as well … if you liked Linen Thread, you will love this Linen Trim. 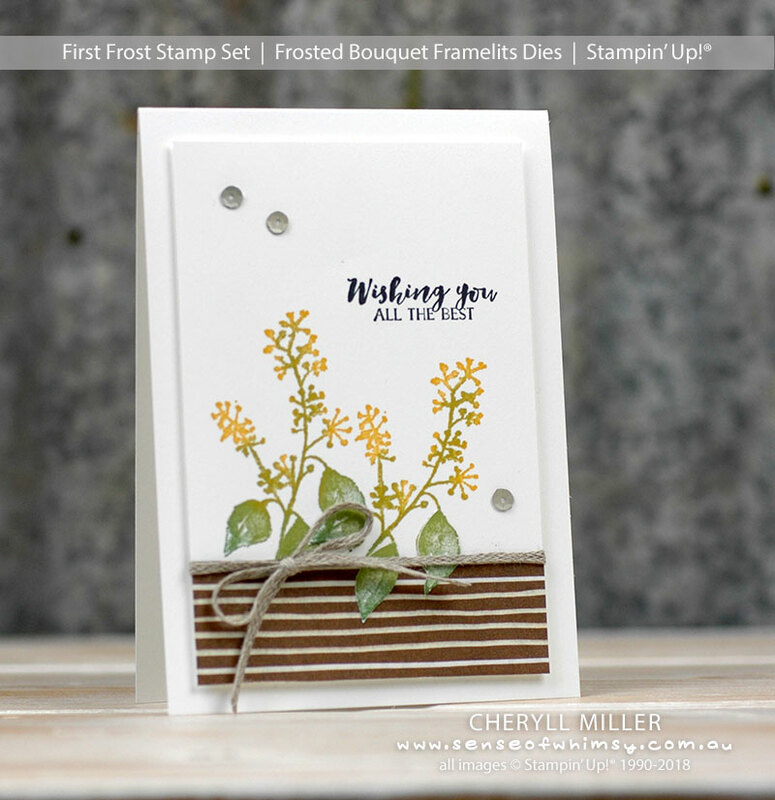 The florals are stamped directly onto Whisper White card and then I stamped just the leaves on scrap card and trimmed them out to pop over the frontmost flower so they sit over the striped paper. It creates definition where the two images overlap and adds an extra dimension to the flowers. I just love this card! You know how sometimes you create and everything just comes together? … this was one of those cards. Prepare to be wattle spammed! The base card is Gray Granite. The watercolour wash of Crushed Curry ink is on Watercolour Paper. 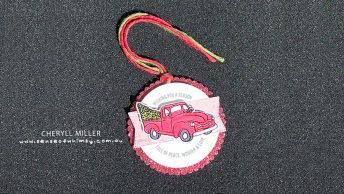 Additional interest is added with the cross stitch pattern die from Stitched Labels Framelits. The ribbon trim is Gray Granite Textured Weave Ribbon with that lovely Braided Linen Trim tied over the top. 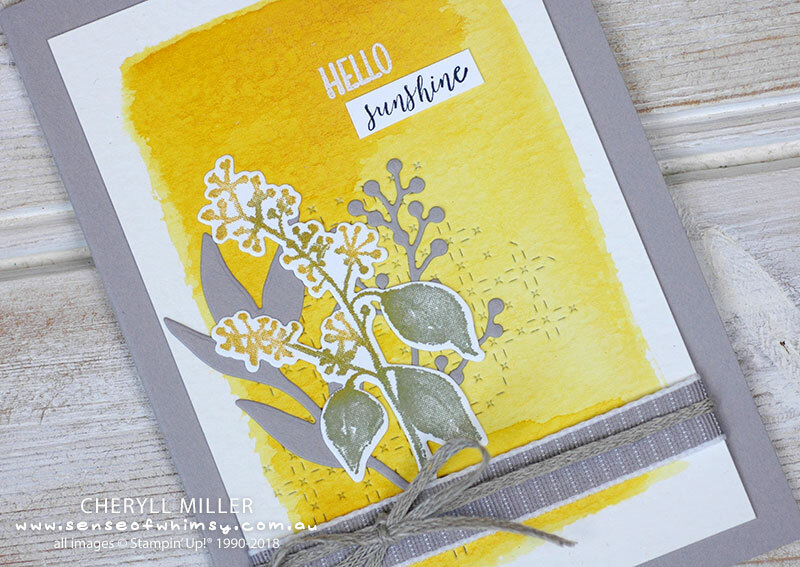 The greeting comes from all over the place … “Sunshine” is part of a circular greeting from Stitched All Around Stamp Set, and “Hello” is from another new stamp set, Country Lane. It’s been white embossed directly onto the card front. And look at the gorgeous gold shimmer on the wattle flowers!! 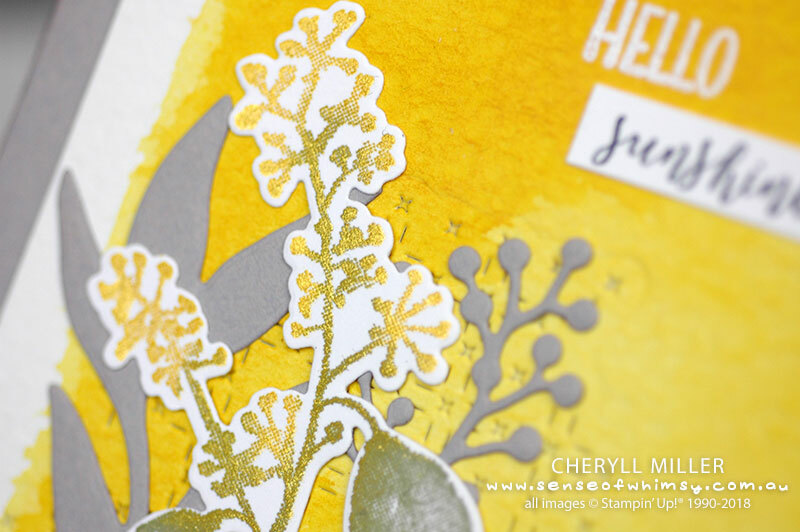 I have stamped my wattle in the same manner as the first wattle card, using the Stamparatus to blend the colours, except the last layer is Vegas Gold Shimmer Paint … yes, you guessed it … another new and upcoming product! It is delicious!!! 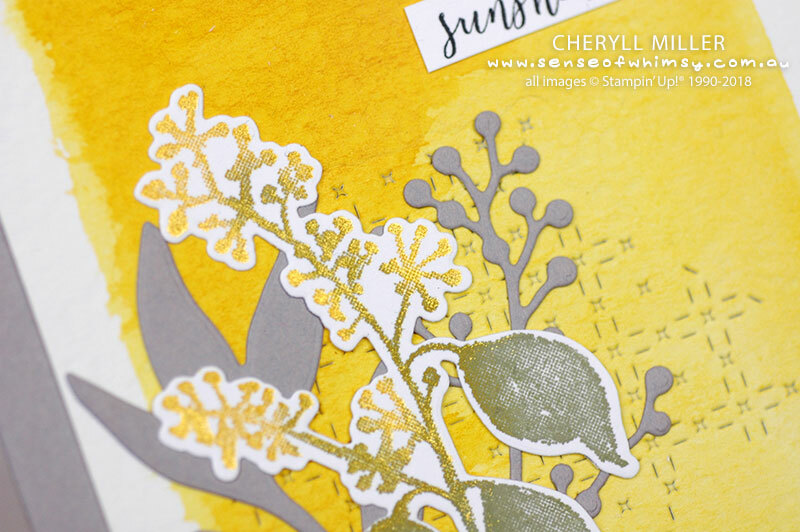 I sponged a little bit of shimmer paint directly onto the stamp, just on the edges of the flowers, before stamping. Using the Stamparatus means you can continue to add colour or shimmer until you are happy with the end result. 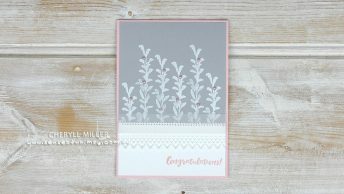 The diecut leaves in the background are from the Frosted Bouquet Framelits and Gray Granite Card. 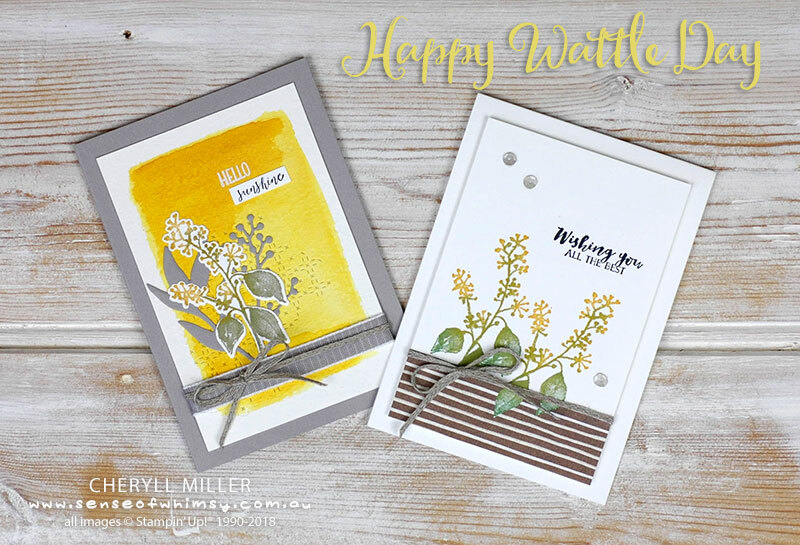 So I hope you have enjoyed my little tribute to Wattle Day using the exciting First Frost stamp set. 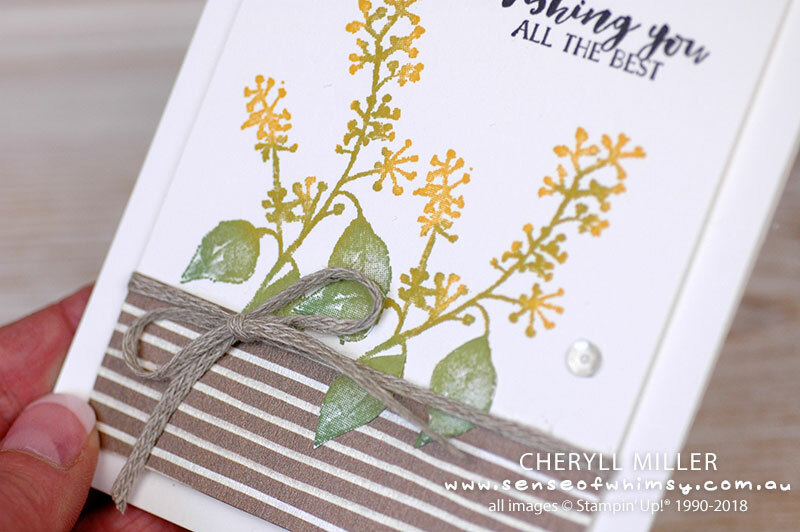 Cheryll, what a great & creative idea to use the spray from the “First Frost” as wattle! Thank you for sharing. Love this set Cheryll. It will be on my next order. Really lovely cards Cheryll, especially the ‘hello sunshine” one!